“Can You Every Forgive Me?” is a great movie on several levels and for several reasons. 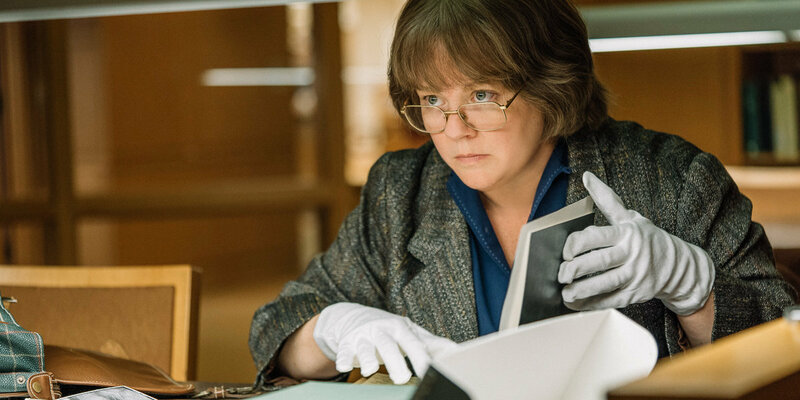 The performance from Melissa McCarthy – in a year in which she gave us “The Happytime Murders” - is a genuinely great piece of work. And yes Melissa, I will forgive you for that horrid puppet disaster. Featuring a rare dramatic performance from the usually silly star, the film forces us to care about a person who does horrible things and befriends a horrible person. That other horrible person is played by Richard E. Grant in a wonderful, scene-stealing performance. Despite the fact that this is a film about a writer who forges letters from other famous writers – which frankly sounds like a bore, it is anything but- it’s gripping, funny and sad. It’s not so much a story about a writer so much as it is a story about a con artist who we root for to get away with crime after crime as she tries to turn her crappy life around. It was enthralling. Set in the early 90s, Melissa McCarthy players writer Lee Israel who wrote several biographies. The film is set several years after the release of her failed book about Estee Lauder. Stuck in a rut of financial woes and writer’s block Israel begins selling some of her possessions including a letter from Katherine Hepburn. While researching for an upcoming book about Fanny Brice, Israel happens upon a letter written by Fanny and before she knows it Israel begins forging letters from other dead writers to sell to collectors who are completely fooled by their seeming authenticity. Israel spends most of her time writing in bars where she converses with her eccentric friend Jack (Grant) who she confides in about her forgery. Writers Nicole Holofcener and Jeff Whitty have crafted a pretty well-done script considering we’re pretty much watching a woman write most of the time. Marielle Heller’s direction is also superb. They dare to make Israel an unlikable antihero – she’s nasty and snippy to almost everyone she comes in contact with – her apartment is a disgusting mess – and she’s generally unkempt – but somehow those involved obviously McCarthy make the character even a bit relatable and sympathetic. For instance, when her cat becomes ill and she can’t even afford the vet bills Israel is obviously at wit’s end. McCarthy and Grant also have a naturalist chemistry together – the banter given to them by the screenwriters is really fun to watch. And it’s really amazing how quickly you get caught up in what Israel is doing – and how seemingly easy it is for her to do. Of course it’s not all a piece of cake, one sequence involving her stealing actual documents from an archive is as suspenseful in anything in a “Mission: Impossible” movie.